Team Meat has busted out the vitriol and the hyperbole as it decries episodic gaming as a con. Team Meat, developer of XBLA platformer Super Meat Boy, has laid in to episodic gaming, saying that it's just a way for publishers to force people into paying more for a game. Team Meat vowed to kill itself before it would ever release an episodic game. The colorful statement originated on Team Meat's Twitter feed, where it was asking fans about the best way of getting the game on to the Wii. The size limit for WiiWare games - just 39MB - made the game too large to release as it was, so Team Meat asked fans whether they'd be willing to accept an obviously inferior version compared to the XBLA game, or wait for a $20 retail version with extra content. When the idea of splitting the game up into episodes came up, Team Meat very quickly shot it down, saying that the logistics of doing so would cause more of a delay than releasing it in stores. It seems that not all fans saw the first reply, however, and kept suggesting an episodic release, leading to Team Meat to comment, "Dear Internets: Super Meat Boy on Wii will NOT be Episodic. That's retarded and we won't do it. I'd rather kill myself." When fans questioned the reasons behind the harsh wording of its previous comment, Team Meat responded with, "[Episodic gaming is] a way for companies to trick you into paying more for a game. Sonic f*cking 4." There's obviously an element of truth in Team Meat's comments - there is potential for abuse in the episodic gaming model - but there's simply no way that gouging customers for cash is the only reason a developer decides to make an episodic game. Admittedly, the example that Team Meat cites, Sonic 4, is kind of pricey at around $15, but on the other hand you have developers like Telltale, which sells its episodic games at a very reasonable price, which makes it impossible to make any generalization about motive. 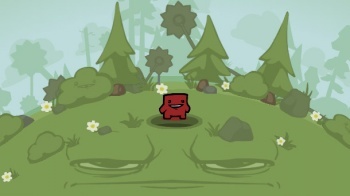 Super Meat Boy is available now for Xbox Live Arcade, and comes out for Mac and PC via Steam later this month.